Together, the combination of R1, C1, R2, R3, and Q1 form a relaxation oscillator, which outputs a square wave signal. Explain how a square wave oscillation is able to perform a simple time-delay for the load, where the load energizes a certain time after the toggle switch is closed. Also explain the purpose of the RC network formed by C2 and R4. Remember that CR1 only needs one pulse at its gate to turn (and latch) it on! C2 and R4 form a passive differentiator to condition the square wave signal from the UJT oscillator. Follow-up question: how would you suggest we modify this circuit to make the time delay adjustable? Knowing that the UJT forms an oscillator, it is tempting to think that the load will turn on and off repeatedly. The first sentence in the answer explains why this will not happen, though. I got the basic idea for this circuit from the second edition of Electronics for Industrial Electricians, by Stephen L. Herman. 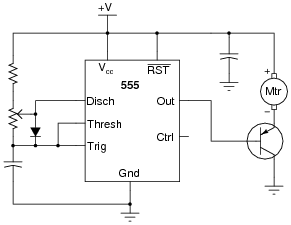 The various inputs and outputs of this circuit are labeled in the above schematic as they often appear in datasheets ("Thresh" for threshold, "Ctrl" or "Cont" for control, etc.). Explain what is happening in this astable circuit when the output is "high," and also when it is "low." 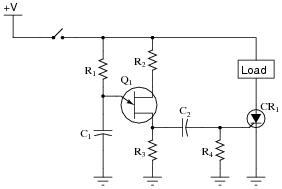 When the output is high, the capacitor is charging through the two resistors, its voltage increasing. 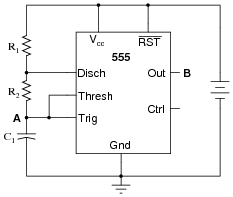 When the output is low, the capacitor is discharging through one resistor, current sinking through the 555's "Disch" terminal. Follow-up question: algebraically manipulate the equation for this astable circuit's operating frequency, so as to solve for R2. Challenge question: explain why the duty cycle of this circuit's output is always greater than 50%. 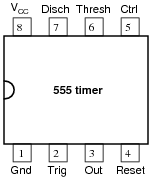 This popular configuration of the 555 integrated circuit is well worth spending time analyzing and discussing with your students. With the diode in place, the output waveform's duty cycle may be adjusted to less than 50% if desired. Explain why the diode is necessary for that capability. Also, identify which way the potentiometer wiper must be moved to decrease the duty cycle. 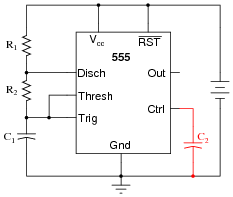 The diode allows part of the potentiometer's resistance to be bypassed during the capacitor's charging cycle, allowing (potentially) less resistance in the charging circuit than in the discharging circuit. To decrease the duty cycle, move the wiper up (toward the fixed resistor, away from the capacitor). This question really probes students' conceptual understanding of the 555 timer, used as an astable multivibrator (oscillator). If some students just can't seem to grasp the function of the diode, illuminate their understanding by having them trace the charging and discharging current paths. Once they understand which way current goes in both cycles of the timer, they should be able to recognize what the diode does and why it is necessary. How low does the triggering voltage have to go in order to initiate the output pulse? Also, write an equation specifying the width of this pulse, in seconds, given values of R and C. Hint: the magnitude of the supply voltage is irrelevant, so long as it does not vary during the capacitor's charging cycle. Show your work in obtaining the equation, based on equations of RC time constants. Don't just copy the equation from a book or datasheet! The triggering pulse must dip below 1/3 of the supply voltage in order to initiate the timing sequence. Have your students show you how they mathematically derived their answer based on their knowledge of how capacitors charge and discharge. Many textbooks and datasheets provide this same equation, but it is important for students to be able to derive it themselves from what they already know of capacitors and RC time constants. Why is this important? Because in ten years they won't remember this specialized equation, but they will probably still remember the general time constant equation from all the time they spent learning it in their basic DC electricity courses (and applying it on the job). My motto is, "never remember what you can figure out." 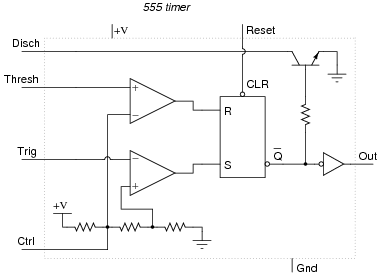 Each 555 timer's cycle is triggered by the negative edge of the pulse on the trigger terminal. 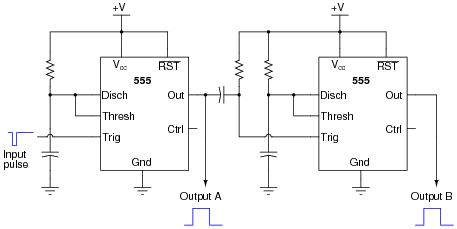 A passive differentiator network between each 555 timer ensures that only a brief negative-going pulse is sent to the trigger terminal of the next timer from the output terminal of the one before it. Follow-up question: when timer circuits are cascaded like this, do their time delays add or multiply to make the total delay time? Be sure to explain your reasoning. Practical applications abound for such a circuit. One whimsical application is to energize sequential tail-light bulbs for an automobile, to give an interesting turn-signal visual effect. 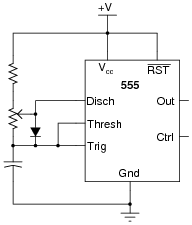 A sequential timer circuit was used to do just this on certain years of (classic) Ford Cougar cars. Other, more utilitarian, applications for sequential timers include start-up sequences for a variety of electronic systems, traffic light controls, and automated household appliances. Resistor R1 fails open: Capacitor voltage holds at last value, output voltage holds at last value. Solder bridge (short) across resistor R1: Timer IC will become damaged at the first discharge cycle. 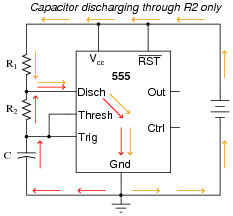 Resistor R2 fails open: Capacitor voltage holds at last value, output voltage holds at last value. Solder bridge (short) across resistor R2: Oscillation frequency nearly doubles, and the duty cycle increases to nearly 100%. Capacitor C1 fails shorted: Capacitor voltage goes to 0 volts DC, output voltage stays "high". Transistor Q1 fails open (collector-to-emitter): Lamp remains off, no current through any terminal of Q2. 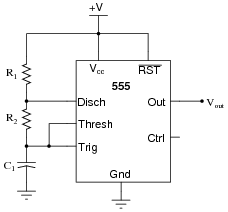 Transistor Q2 fails open (collector-to-emitter): Lamp remains off, no current through any terminal of Q2, normal base current through Q1, no current through collector of Q1. Resistor R3 fails open: Lamp remains off, no current through any terminal of Q1 or Q2. Transistor Q1 fails shorted (collector-to-emitter): Lamp remains on, full ön" current levels through terminals of Q1 and Q2. What would happen to the operation of this astable 555 timer circuit if a resistor were accidently connected between the "Control" terminal and ground? Explain the reason for your answer. The addition of a resistor between the Control terminal and ground would increase the frequency of the circuit, as well as decrease the peak-to-peak amplitude of the ßawtooth" wave signal across the timing capacitor. Follow-up question: does the addition of this resistor affect the output signal (pin 3) amplitude as well? Explain why or why not. If it amplitude is affected, does it increase or decrease with the resistor in place? Ask your students to explain why frequency and amplitude changes in this circuit. It is far too easy for a student to simply repeat the answer given by the worksheet! Hold your students accountable to reasoning through the operation of a circuit like this. A student builds their first astable 555 timer circuit, using a TLC555CP chip. Unfortunately, it seems to have a problem. Sometimes, the output of the timer simply stops oscillating, with no apparent cause. Stranger yet, the problem often occurs at the precise time anyone moves their hand within a few inches of the circuit board (without actually touching anything!). What could the student have done wrong in assembling this circuit to cause such a problem? What steps would you take to troubleshoot this problem? I won't reveal the most probable cause, but I will give you this hint: the TLC555CP integrated circuit ("chip") uses CMOS technology. Every year it seems I have at least one student who experiences this particular problem, usually as a result of hasty circuit assembly (not making all necessary connections to pins on the chip). This is a good question to brainstorm with your class on, exploring possible causes and methods of diagnosis. Solder bridge past resistor R2. No power to either 555 timer IC. Be sure to discuss the reasons why each of your students' proposed component faults would cause the final output to never go high. The possibilities range from the obvious to the obscure, and exploring them will strengthen your students' understanding of the 555 as a monostable multivibrator. One of the major advantages to using PWM to proportion power to a load is that the final switching transistor operates with minimal heat dissipation. If we were to use a transistor in its linear (äctive") mode, it would dissipate far more heat when controlling the speed of this motor! By dissipating less heat, the circuit wastes less power. Explain why the power transistor in this circuit runs cooler when buffering the PWM signal from the 555 timer, rather than if it were operated in linear mode. Also, identify which direction the potentiometer wiper must be moved to increase the speed of the motor. Challenge question: suppose we needed to control the power of a DC motor, when the motor's operating voltage was far in excess of the 555 timer's operating voltage. Obviously, we need a separate power supply for the motor, but how would we safely interface the 555's output with the power transistor to control the motor speed? Draw a schematic diagram to accompany your answer. I'll let you research the answer to why PWM is a more energy-efficient way to control load power. This is a very important concept in power electronics! To increase the speed of the motor, move the potentiometer wiper up (as pictured in the schematic). There is much literature available discussing PWM power control, and its advantages over linear power control. Your students should have no difficulty finding it on their own! Discuss with them the proposed solution to the high-voltage motor problem. 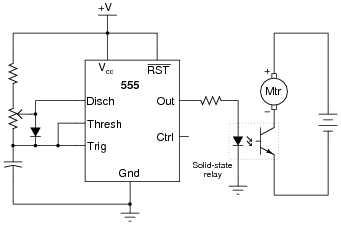 What purpose(s) do/does the solid-state relay serve? Is there a way to achieve PWM control over the motor without using an optocoupled device? If so, how? Let your students show their solutions and discuss the practicality of each. 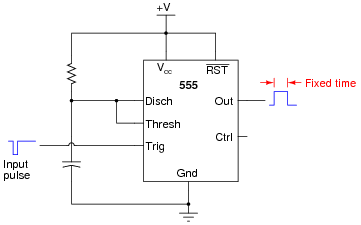 It is common to see a capacitor connected between the "Control" terminal and ground in 555 timer circuits, especially when precise timing is important. Explain what purpose the capacitor C2 serves in this circuit. 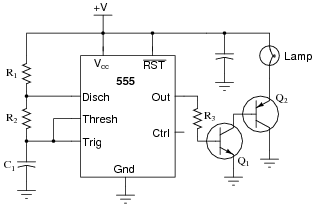 C2 acts as a decoupling capacitor, to help stabilize the threshold and trigger reference voltages internal to the 555. Challenge question: what operational parameters of the circuit define the necessary capacitance value of C2? Decoupling power supply pins on a chip is important, but here students get to see another variation of decoupling. If time permits, work through a sample problem with your students sizing capacitor C2, given a certain operating frequency of the astable circuit. Note: this will give you another opportunity to use Thévenin's Theorem . . .
Special integrated circuits called delay elements or delay gates are manufactured to provide nanoseconds' worth of intentional time delays in digital circuits. Identify a part number for such an IC, research its datasheet, and describe an application where one might be needed. One part number for you to research is 74LS31. Such delay elements might be used to provide ample set-up and/or hold times for signals entering flip-flop. 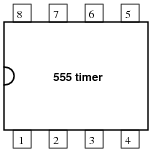 Discuss with your students why such devices exist, in light of the existence of 555 timers. Why couldn't a 555 timer be used for the same purpose as the 74LS31? An important measurement of pulse waveforms is duty cycle. Give a precise. mathematical definition for this term. Also, write an equation solving for pulse width given duty cycle (D) and frequency (f). I'll let you figure out how to write an equation solving for pulse width (ton) in terms of duty cycle and frequency. 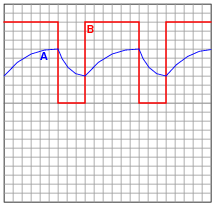 Duty cycle is a very important concept, as analog information may be conveyed through the variable duty cycle of an otherwise digital pulse waveform. Discuss this application with your students, if time permits. This question is a simple exercise in researching a component datasheet. Base your equations on the general rules of RC time constant circuits. Don't just copy the completed equations from some reference book! Assume that the 555's discharge transistor is a perfect switch when turned on (0 volts drop). Note that the supply voltage is irrelevant to these calculations, so long as it remains constant during the charging cycle. Follow-up questions: write an equation for the circuit's frequency, given values of R1, R2, and C. Then, write another equation for the circuit's duty cycle. Have your students show you how they mathematically derived their answer based on their knowledge of how capacitors charge and discharge. Many textbooks and datasheets provide this same equation, but it is important for students to be able to derive it themselves from what they already know of capacitors and RC time constants. Why is this important? Because in ten years they won't remember these specialized equations, but they will probably still remember the general time constant equation from all the time they spent learning it in their basic DC electricity courses (and applying it on the job). My motto is, "never remember what you can figure out." The challenge questions are worthwhile to do in class, even if few students were able to derive them on their own. If nothing else, such an exercise reviews the meaning of "frequency" and its relationship with period, as well as the definition of "duty cycle."